Exhibition Of Paintings By Jaya Baheti is an event that took place between 25-May-2007 and 16-Jun-2007 in Hyderabad. At a micro level, Jaya's inspiration is rural life. At a macro level, it is excellence. For the art-lovers of town, her works draw level, talking to them in their plane. Kalahita Art Foundation presents Song Of Life, an exhibition of paintings showcasing works of Jaya Baheti, from 25th May to 16th June. The exhibition showcases 50 works of Jaya, and will be inaugurated by Padmasri Jagdish Mittal, a veteran artist. Jaya's memory of her visit as a child to Manwat, her ancestral village in Marathwada, and her usual visits to Theur Hadapsar and Urali Kanchan, both villages situated along the highway from Pune to Sholapur, perhaps explain her absorption for the rural life. Thus at the very beginning of her artistic journey, Jaya took the soft, muddy rustic lanes to look into the eyes of the village women and men, who are as simple as the lines define them to be. Their reticence in going about their daily chores, raises questions. Jaya was born in 1969 in Pune, and passed the Govt. Diploma in Art during 1986-1992, from Abhinav Kala Mahavidyalay, Pune. Her current works unfolding through "The Songs Of Life" define the sojourn well as one will see a subtle divergence of focus. The paintings reflect absorptions from day-to-day experiences, set against a rural backdrop. A reference to Indian music is also incorporated to define nuances of anticipation, sensuous musing in the moonlight, companionship and affection for the child. Those are defined as Vrindavan Sarangi, Yaman Kalyan and Bilawal respectively. The animals that surround the householders in the paintings are all absorbed from her immediate environment. 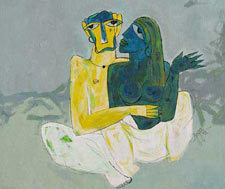 And the men and the women depicted in Jaya's works rarely shift their gaze from the beholder. They have knowledge and understanding of life that they wish to convey. Their sensibilities hold the thread of karma, and the kite, an allegory of providence, carries a complex wisdom. The application of paints in square and rectangular constructions attributes a sense of multiple planes and shifts. This in turn adds dimension and movement to a stolid composition. The interval of textured and colored areas in relation to the flat white and grey areas introduces rhythm. The paintings are subtitled as 'Raaga', based on Indian melodies and their sensibilities that the artist finds reflected in human activity and emotion. Please contact 2335-0543 for further details. Be the first to comment on Exhibition Of Paintings By Jaya Baheti! Just use the simple form below. fullhyd.com has 700,000+ monthly visits. Tell Hyderabad what you feel about Exhibition Of Paintings By Jaya Baheti!